Ever felt so bloated that you wished you hadn’t eaten that plate of fried chicken for lunch? We totally understand how you feel! Bloating can get really uncomfortable and cause you to lose your productivity at work or school, and we know how bad bloating might get for females when it’s that time of the month. So we’ve come up with a list of 10 Best Detox Foods that can help to get rid of all the toxins in your system. And the list goes on.. Avocados are not only healthy, but also super tasty and it goes well with anything! We embrace all forms of avocados – guacamole, avocado toast, avocado milkshake.. mmm. Asparagus! Do not underestimate this thin plant-like vegetable. Not only do asparagus help to detoxify the body, it also helps with liver drainage, meaning it aids the liver to drain all the toxins in your body! It’s also been said that asparagus can help to relieve your hangovers due to the amino acids and minerals found in it. I’m sure we’re all familiar with this vegetable. You either love it, or hate it. There are enough reasons for you to love broccoli though, as they are so nutritious and suitable for everyone. Broccoli is a powerful detoxifying food due to its enzymes. These enzymes pair up with your liver to help flush toxins out of your body (just like what asparagus does). Seems like eating grapefruits not only helps with detox, it might also help in reducing weight as well as getting that radiant skin! What’s a reason not to try it now? Green tea is often a must-have when doing a detoxifying program due to its high antioxidant value. Having mentioned antioxidants quite a few times previously, what do they actually do? Antioxidants help to kill free radicals before they can do any damage to our system, and antioxidants are also very good for you skin! Take note, ladies! Replace your sugary drinks with green tea or have a cup of hot green tea after your meal to help cleanse your system. When life gives you lemons…feed them to your pets to see their reaction. Just kidding! When life gives you lemons, use these lemons to detox! Lemons are one of the most popular foods used in detoxifying. It is simple, fast, and very affordable. Starting the day with a cup of warm water mixed with lemon slices aids digestion, and adding lemon juice into your normal water helps to further flush toxins out of your body. Not only is it good for your system, lemons are good for your skin as well! Turmeric may not be an ingredient that many are familiar with, but you will be after hearing of its benefits. Turmeric is a herb that is usually used in hot teas or in cooking, as it is the main spice used in curries. Research has shown that turmeric has a direct effect with the liver and is said to work miracles if drank for a week (with a healthy diet). That aside, turmeric’s benefits are caused by an antioxidant it contains, called curcumin. Curcumin eases inflammation in the body, and in turn helps to prevent cancer and diabetes. Curcumin also helps to prevent buildup of fatty tissues in your arteries, thus reducing the chance of heart diseases. All in all, artichokes are very good for your system and if you haven’t tried one, you definitely should! Beetroot is not as commonly seen as the other ingredients, and you may only find them in Greek salads or juice stores. However, after you realise how great these weirdly-colored foods are, you’ll definitely want to watch out for them. 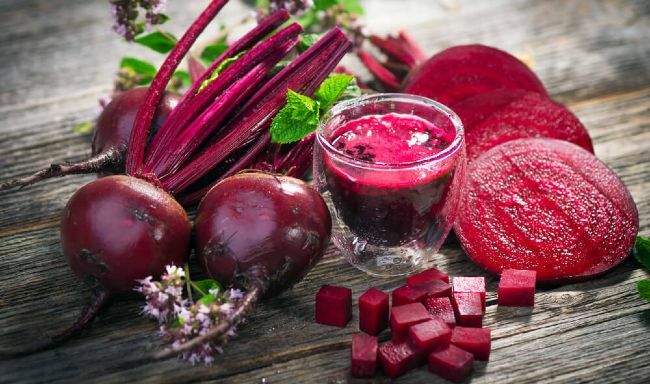 The existence of beetroots dates back to the Roman times, when beets were used to treat fever, wounds and skin problems, as well as being used as an aphrodisiac. Beetroots also contain a type of antioxidant called betalains, which help to repair and regenerate cells in our body. Now you have a reason to look out for beetroots whenever you’re dining out! So there we have the list of 10 best foods to eat for detoxification. Try some of these and they might just be your ticket to a flat belly! Thanks to our friends at The Ladies Room for their invaluable contribution. Visit their website to learn more about their product.